Easter is celebrated all around the world on April 16 of this year. Easter menu have loaded of fantastic breads especially in most of the European countries, though its a religious festival, many cuisines have their own Easter breads. 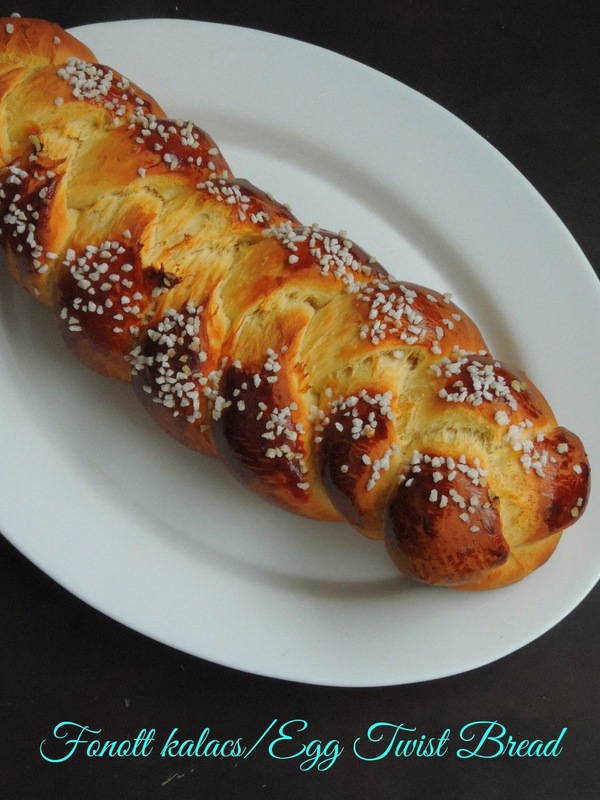 Easter, as many festival holidays in Hungary is very much associated with food and freshly baked breads.Easter breads is definitely one of the delicacies on this holiday menu. The traditional Hungarian Easter bread is Egg Twist aka Fonot Kalács which is a yeasted sweet bread made either with raisins, chocolate chips or else without these two ingredients. Usually baked with three braids, this sweet bread is very spongy and delicious as much as like French Brioche. Almost like Challah bread, this bread have their important place in Easter lunch or dinner table as an accompaniment to serve along with the main dish. This sweet bread is very easy to bake if yeast god works awesome with your hands, i enjoyed thoroughly baking this fantastic bread. This bread calls for egg yolks to make the dough bit eggy, if you love eggy breads then this bread is for you. Trust me, while baking this bread, the aroma from this bread will definitely fill the house. Either served warm or at room temperature, this Hungarian egg twist bread makes an excellent snack or breakfast. If conserved properly, this bread stays very much prefect even after a day. We enjoyed this bread with jam while kids had this bread with their favourite chocolate spread.Fonott Kalacs, this bread will definitely tickle your tastebuds. 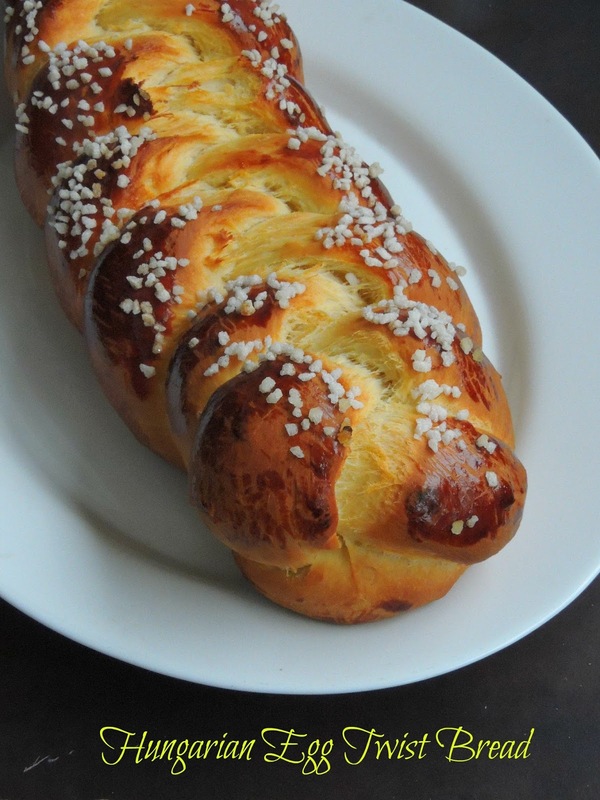 Am running this month's mega marathon with A-Z baking aroung the world, obviously my today's Alphabetical letter is 'F', hence am posting Fonott Kalacs aka Hungarian Easter bread. Take the flour,dry instant yeast in a large bowl, meanwhile heat the milk in microwave oven bowl to lukewarm milk. Add the sugar, egg yolks,salt to the milk, whisk it.Add this mixture to the flour mixture. Start kneading the dough, slowly add the butter in small pieces and knead everything well until the dough turns smooth and soft dough. Drop the dough in a greased bowl and let it sit in a warm place. Let the dough rise until doubled in size.Remove the dough, punch down and divide into three equal balls. Shape the dough as three ropes, now start braiding the three ropes to form a three braided bread loaf. Arrange the shaped loaf in a baking sheet lined baking tray, let it rise agin for an hour. Preheat the oven to 350F, brush the top of the bread with egg yolk and sprinkle the sugar pearls. Bake in preheated oven for 35-40minutes until the top of the bread turns golden brown. Let the loaf cool completely, slice and enjoy. That is a gorgeous loaf of bread Priya. Love how golden the crust turned out -- perfectly baked. 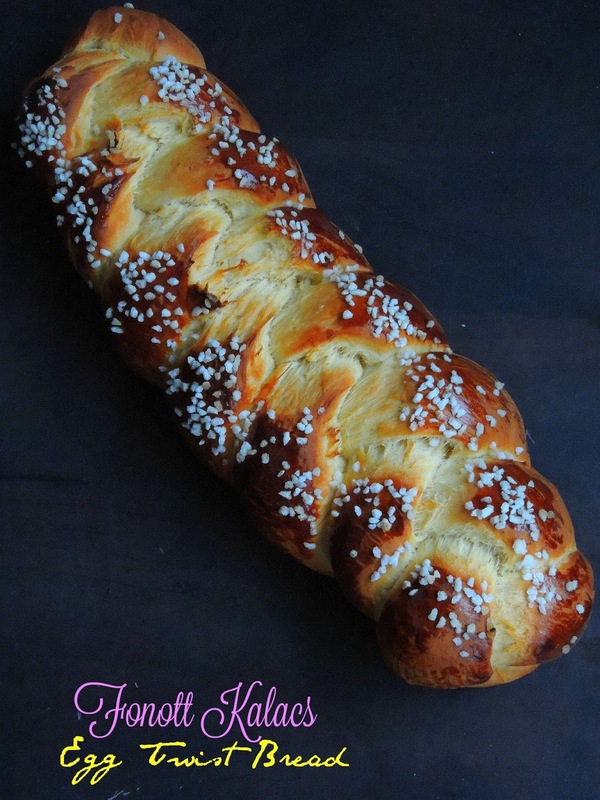 This one looks so pretty...exactly how I had intended my challah to be! That's a lovely find for F. Each one of your dishes is unique. Looks gorgeous! Beautiful looking braided bread..Love the sugar pearls on top. What a beautiful looking bread this is Priya! So perfectly braided and love the color of the bread. Love love love the color and the braid on the bread.. it's awesome! Great pick with Easter a week away. You are a master Priya..that bread is so well done..the braiding is par excellence, the crust is beautifully golden..simply wow ! Wow Priya that bread looks awesome!..you make bread making so simple! Indeed Yeast god worked very well in your hands.. delicious bake!! That's a gorgeous loaf you got there.. Amazing bake. Great Easter treat.